How long will you walk with a tiny pebble in your shoe? It is barely noticeable. Really, you pay it no attention if something else is on your mind. But still, when you notice that pebble, it bothers you. How long do you put up with it before you do something about it? 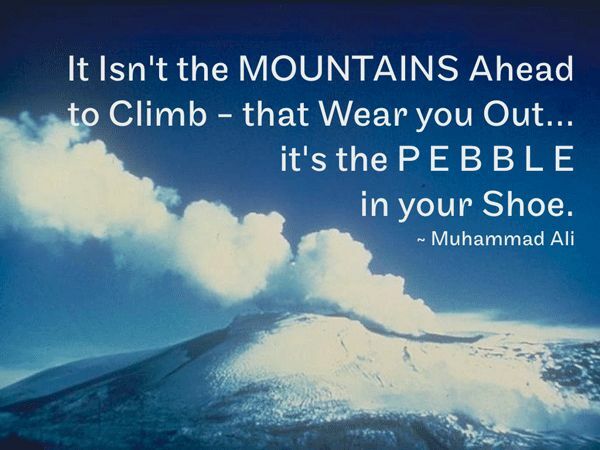 If you are on the move, with somewhere to be, that pebble might just stay in your shoe for awhile. Because removing the annoyance would require stopping for a moment, removing your shoe, extracting the pebble, adjusting your sock, and putting your shoe back on. Stopping your forward progress, even if it will ease your journey forward doesn't seem worth it. With any pebble though, there comes a point when the annoyance outweighs the trouble of stopping. So you stop, remove the pebble, and those first pebble-free steps are awesome! Sometimes, you giggle at your self for putting up with the annoyance for so long! The pebble is gone and progress resumes better than ever! What about at school? Are there some pebbles that annoy you just a little bit? Perhaps a certain procedure that doesn't quite function smoothly. Perhaps a part of your daily lessons that don't produce the engagement you hoped for. Perhaps a part of your lesson-planning process that could definitely be better, if only you would stop and address the irritant. Maybe you are not getting the results you hope for from your current math practices. Maybe your writing instruction lack true authenticity and the kids don't see the purpose. Teachers usually know of several things that could be better. But school is almost always moving quickly. There doesn't seem to be time to stop and take care of the problem. Or maybe the solution isn't as easy simple as removing your shoe. The solution may actually be unknown. You know there is a better way, you just don't know what it is. Or, you know you want something to be a little different, you just aren't sure the eventual improvement is worth the effort to make it happen. It is worth it. If it wasn't, we would all be walking around with pebbles in our shoes!